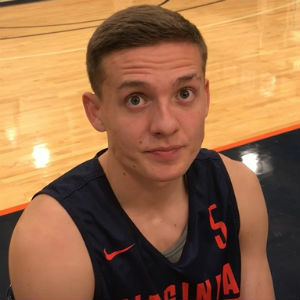 UVA basketball’s Kyle Guy (Indianapolis, Ind.) was one of 20 players named to the watch list for the 2019 Jerry West Shooting Guard of the Year Award, the Naismith Memorial Basketball Hall of Fame announced Tuesday (Oct. 16). Named after Hall of Famer and former Los Angeles Laker and West Virginia guard Jerry West, the annual honor now in its fifth year recognizes the top shooting guards in Division I men’s college basketball. A national committee comprised of top college basketball personnel determined the watch list of 20 candidates. Guy earned AP and NABC All-America third-team honors after leading ACC champion Virginia in scoring (14.1 ppg) and 3-pointers (83). He was named All-ACC First Team after helping Virginia to a 17-1 regular-season record. Guy earned ACC Tournament MVP honors, averaging 16.7 points in the Cavaliers’ three victories in Brooklyn, N.Y. He reached double-figures in 28 games, including a career-high 29 against VCU, and led Virginia in scoring in 15 contests. West averaged 24.8 points and 13.3 rebounds per game in his three varsity seasons at West Virginia. He led his team to the NCAA Championship game in 1959 and was named a consensus All-American in 1959 and 1960. In the summer of 1960, he was co-captain of the U.S. men’s basketball team and won an Olympic gold medal. As a professional player, West played 14 seasons in the NBA with the Lakers making the All-NBA First Team 10 times. West won an NBA championship in 1972 and was named the NBA Finals MVP in 1969 despite his team not winning the championship. In 1996, he was named a member of the NBA’s 50th Anniversary All-Time Team. By mid-February, the watch list of 20 players for the 2019 Jerry West Shooting Guard of the Year Award will be narrowed to just 10. In March, five finalists will be presented to Mr. West and the Hall of Fame’s selection committee. The winner of the 2019 Jerry West Award will be presented at the ESPN College Basketball Awards Show presented by Wendy’s in Los Angeles on Friday, April 12, 2019. Broadcast information will be released at a later date. Previous winners of the Jerry West Shooting Guard of the Year Award include Carsen Edwards, Purdue (2018), Malik Monk, Kentucky (2017), Buddy Hield, Oklahoma (2016) and D’Angelo Russell, Ohio State (2015). For more information on the 2019 Jerry West Award, log onto www.hoophallawards.com and follow @hoophall on Twitter and Instagram.